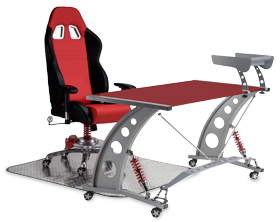 European custom automotive accessories designer, Henri Lenterman, takes pleasure in introducing to the worldwide motoring enthusiasts his racing inspired PitStop Furniture line. Designed for all active lifestyles, this exhilarating, high performance automotive furniture line is engineered and manufactured using the highest quality components available today! Visually breathtaking, it surpasses the customer's expectations and carries the Intro-Tech Automotive, Inc., Lifetime Warranty!